Every point on the ARC triangle is dependent on the other two, and every two are dependent on one. One can’t cut down one without cutting down the other two, and one can’t rehabilitate one without rehabilitating the other two. On the positive side, one can rehabilitate any point on the triangle by rehabilitating any other point on it. 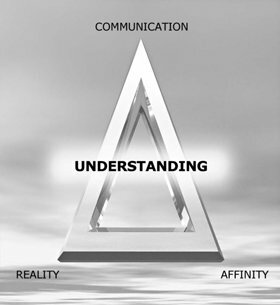 Affinity, reality and communication form the ARC triangle, with each point dependent upon the other two. These are the component parts of understanding. The interrelationship of the triangle becomes apparent at once when one asks, “Have you ever tried to talk to an angry man?” Without a high degree of liking and without some basis of agreement there is no communication. Without communication and some basis of emotional response there can be no reality. Without some basis for agreement and communication there can be no affinity. Thus we call these three things a triangle. Unless we have two corners of a triangle, there cannot be a third corner. Desiring any corner of the triangle, one must include the other two. The triangle is not an equilateral triangle. Affinity and reality are very much less important than communication. It might be said that the triangle begins with communication, which brings into existence affinity and reality. Since each of these three aspects of existence is dependent on the other two, anything which affects one of these will also similarly affect the others. It is very difficult to suffer a reversal of affinity without also suffering a blockage of communication and a consequent deterioration of reality. Consider a lovers’ quarrel: One of the pair offers affinity in a certain way to the other. This affinity is either reversed or not acknowledged. The first lover feels insulted and begins to break off communication. The second lover, not understanding this break-off, also feels insulted and makes the break in communication even wider. The area of agreement between the two inevitably diminishes and the reality of their relationship begins to go down. Since they no longer agree on reality, there is less possibility of affinity between them and the downward spiral goes on. There are three ways of reversing this spiral. One is through raising of the necessity level of the individual. Another is by the intervention of some outside agency which will force the two lovers to agree or communicate. The third is by Scientology processing. Scientology processing is a precise, thoroughly codified activity with exact procedures. 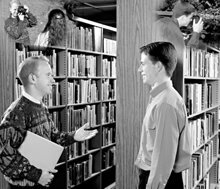 It is a very unique form of personal counseling which helps an individual look at his own existence and improves his ability to confront what he is and where he is. …but can be raised rapidly by communication from someone with whom ARC is high. Unless one of these three ways of reversing the spiral is utilized, eventually all of the reality of the relationship which had grown up between this pair of lovers would vanish and both of the people would be damaged in their total reality, their total ability to communicate, their total capacity for affinity. Fortunately the spiral works both ways. Anything which will raise the level of affinity will also increase the ability to communicate and add to the perception of reality. Falling in love is a good example of the raising of the ability to communicate and of a heightened sense of reality occasioned by a sudden increase in affinity. If it has happened to you, you will remember the wonderful smell of the air, the feeling of affection for the good solid ground, the way in which the stars seemed to shine brighter and the sudden new ability in expressing yourself. 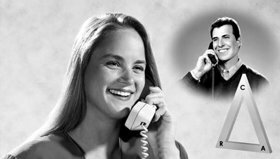 If you have ever been alone, and in a dwindling spiral, only to have the telephone ring and the voice of a friend come across, you will have experienced the halting of a downward spiral through a lift in communication. This is particularly true if the friend happens to be a person with whom you converse easily and who seems to understand the communication which you try to give him. After such an experience, you are probably aware of a great deal more interest in the things around you (reality) and the increase of the feelings of affinity within you. A troopship was slowly approaching the Golden Gate Bridge filled with troops who had been overseas for several months. As the ship slowly approached the bridge, all on board grew very quiet until at last no one was talking at all. Suddenly, as though by prearranged signal, just as the bow of the ship cleared the bridge, the men standing there broke into a tremendous cheer which carried on down the length of the ship as she went under the bridge. Suddenly everyone was talking to everyone excitedly. Men who scarcely knew each other were pounding each other on the back as though they were brothers. America regained some of its reality for these men and communication and affinity suddenly went up. Fast! Affinity, reality and communication are part of everyday life—from a child going to school, through familial relations to governing a nation. And ignorance of their existence and application is equally as widespread; otherwise, one would not be continually swamped with the daily news of turmoil, strife and suffering due simply to lack of understanding. However, knowledge of these components will only carry one so far. They must be applied. But how is that done? A principal application of ARC is to increase affinity, reality and communication, and thus understanding, between oneself and another. How does one talk to somebody else? The way to do this is to establish reality by finding something with which you and the other person agree. Then you attempt to maintain as high an affinity level as possible by knowing there is something you can like about him. All three corners of the ARC triangle will have been established and you are then able to talk to him. Understanding will be possible because the three components of life—affinity, reality and communication—are present.